Family continues to be a focus on the first few episodes of this season. In this one,We get to explore Data and his family as someone unexpected returns in Data’s life. This is Brothers and it originally aired on October 8,1990. 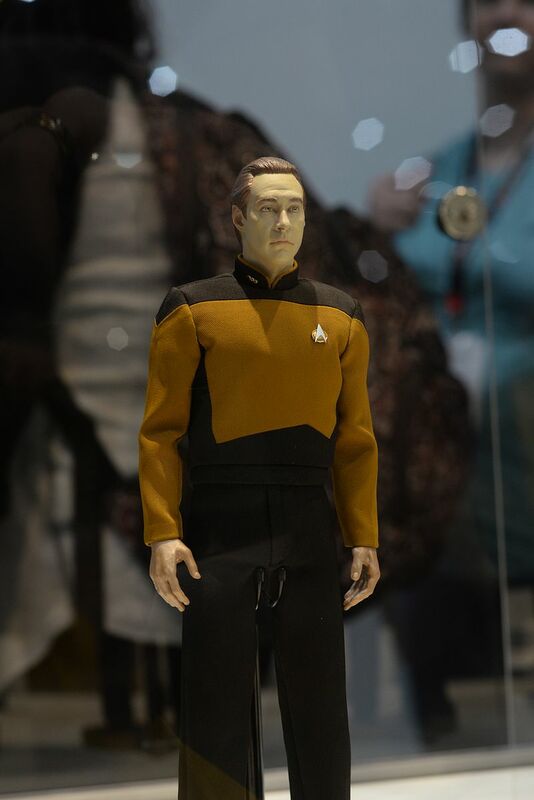 While data is handling a serious medical situation, he is suddenly summoned by a rogue signal which forces him to take over the ship and find someone he believed to be dead. After receiving a random signal, Data suddenly takes over the ship and diverts course. This of course makes things difficult as there is a child who is in terrible danger of death due to a practical joke played by the child’s brother. Picard and the rest of the crew struggle to regain control of the ship as Data has locked everyone out. Upon arriving at the location the signal came from, Data beams himself down to the planet where he comes face to face with his creator, Doctor Noonian Soong. Soong reactivates Data’s autonomy and begins to talk to Data. At first Data is unsure as to who this old man is. Although he looks familiar, he is sure it can not be the man that made him as that man is thought to be dead. However, the signal he sent to retrieve Data summoned another of Soong’s creations, none other than Data’s malevolent brother, Lore. Once Lore has been reactivated it is clear that he is unhappy with his father and his brother alike. As Lore goes to leave, Soong tells them that his life if nearing its end and this will be the last time either of them can get the answers that they desire. Soong soon reveals that he has been working on a special upgrade for Data in the form of an emotion chip. Soong tells Lore that, had he known Lore was alive, Soong would have worked on fixing him as well. Unfortunately there is no more time. Soong goes to rest before installing the chip and that is when Lore gets an idea. Late, Soong installs the chip and soon realizes that he has installed it into the wrong android. Lore has deactivated Data and stolen the emotion chip. Soong tells him that the chip wasn’t meant for him and will not work. Lore attacks Soong and beams away believing Soong to be dead. Worf, Riker and LaForge find the outpost and rescue Data. They find Soong, but it is too late. The old man is too far gone. Data gets a chance to say goodbye before Soong dies. The B story is there just to give the rest of the crew something to do. They need to get the ship to a starbase to save a kids life but with Data taking the Enterprise over, this is now threatened. They eventually figure it all out. As with most Data-centric episodes, this is one of my favorites. Since Data didn’t get a chance to have any screen time in the previous episode Family, this serves as a nice follow up to showcase Data’s family. Data and Lore have a tenuous relationship at best. Lore is jealous of what he believes to be Soong’s favoritism toward his brother Data. When Lore originally started to malfunction, Soong, being a scientist, logically shut him down and started from scratch. This infuriates and deeply offends Lore as this makes him feel unloved and undeserving of love by his maker. That resentment is channeled to Data who Lore sees as his replacement. This kind of thing is a very family dynamic in a lot of families when another sibling is introduced. Now normally the siblings don’t try to kill each other…normally…but the Soongs are not the normal family. Since originally meeting Lore in DataLore, we really only got a sense that he was more of an evil twin for Data. A mirror image what have you. It is not until Brothers, that we see that he is actually a much deeper character. While he is malevolent, he feels betrayed by the man that made him and, as a viewer, you tend to feel sorry for him. Maybe even understanding why he is the way he is. The B story also involves two brothers but the results are dramatically different. When the older of the two plays a practical joke that results in the younger being tragically hurt, the younger wants nothing to do with his older brother. Once the younger is on his way to recovery, it is clear that all is forgiven and they are brothers once more. Beverly comments on this that brother’s forgive. Something Data had yet to consider with Lore. Should he, forgive his brother as he’s not really evil, he’s just built that way. Brent Spiner gets a chance to, once again, showcase his acting skills playing the three roles of Data, Lore and Doctor Soong. I remember the first time I watched the episode I had no clue that he was playing Doctor Soong. He has such an uncanny ability to play multiple roles and truly is an underappreciated actor. This is the first in a much longer ’emotion chip’ story arc that eventually plays out in Star Trek Generations. For Data to have a homing chip is a little scary and almost gives credence to the concerns of Starfleet earlier in the series. Should someone find and exploit that chip, the Enterprise could lose a lot more than just a kid who ate poison berries. I mean, Imagine the Romulans discovering the homing device. That would be bad. This is the 76th episode of the series so that means we have just at 100 left! Wow right! On the left we see Data’s other brother Jeff. Jeff like to dress up in Data’s clothing and stand around.